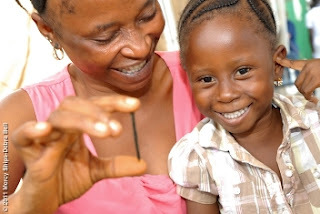 Isatu was crying hysterically as she and her three-year-old daughter, Hawanatu, accompanied a friend to the home of his neighbor, a Mercy Ships day-worker named Bassey. Despite the fact that it was 6:00 a.m., the three were invited in. But Isatu’s crying prevented her from telling Bassey what she wanted. She held out a large envelope. 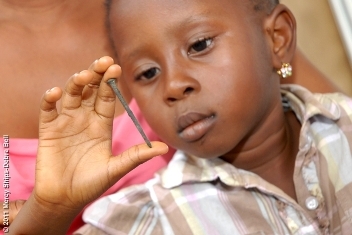 Bassey took it and pulled out an x-ray showing a 2½-inch nail lodged inside the little girl. Pregnant and with three other children to care for, she had reached her emotional limit. So, she took Hawanatu to the home of a trusted friend who lived in Bassey’s neighborhood. Bassey showed the x-ray to the medical team onboard the hospital ship, the Africa Mercy. The child was immediately authorized to see the admission nurse. 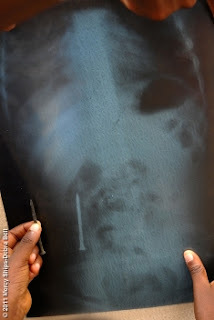 A second x-ray revealed that the nail was taking its natural course. The little girl asked to use the rest room, and the nail came out naturally without piercing any organs. There were shouts of joy from everyone involved. “Everyone here who saw the x-ray has been making an effort to help. 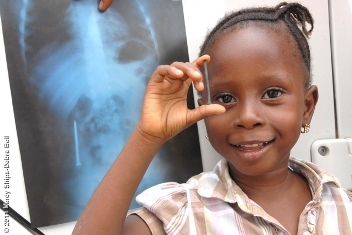 I’m very happy and very relieved!” said a grateful Isatu.